Powers/Abilities: Without armor, Jimmy Zafar was ranked normal for intelligence (high school education), strength, speed, stamina, durability, agility and reflexes, but was a trained marksman and had police training in hand-to-hand combat. However, he had a criminal record against him. His augmented abilities with armor was upgraded to strength classed at Superhuman Class 75 and natural winged flight. The armor was a powerful battlesuit and exoskeleton that increased the wearer's strength and stopped bullets from hand weaponry. 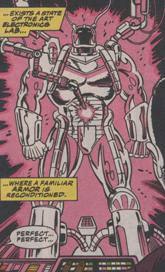 His armor upgrade included power hand-blasters that fired multi-directional high-frequency electrical bolts. The armor also incorporated gas grenades, flares, sonic weaponry and a targeting computer plus cable that could be used to drag heavy objects while flying. It enabled flight via boot jets and had a self-contained oxygen supply for one hour, as well as a silent running mode that delivered barely audible flight after its upgrade. 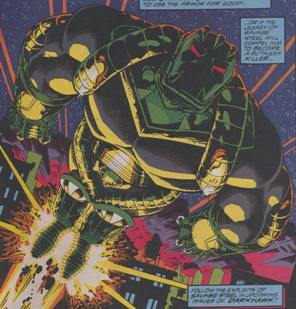 The initial battlesuit was designed and manufactured by Tony Stark with the later design modified by former Stane International engineers (Tim, Stu and Jane) and formed a mesh suit with solid armor casings that fitted into an oversized briefcase. (Darkhawk#3-4, 6) - As a police officer, Jimmy Zafar encountered Chris Powell several times. (Darkhawk#16 (fb)) - Zafar attended Mike Powell's funeral. (Darkhawk Annual#1/5) - Jimmy Zafar broke Arthur Vale and Harry Lennox out of Tombs prison but set it up to make it appear that they had died from a drive-by shooting after escaping to make the Cabal think they were dead and would no longer pursue them. They planned to testify against the Cabal. (Darkhawk#26/2) - Vale unwillingly led members of the Cabal to an FBI safehouse for government witnesses, targeting to kill the former Cabal members Jimmy Zafar, Johnny Leone and Harry Lennox. (Darkhawk#27/2) - Zafar helped the overcome FBI agents, firing back at the Cabal attackers. However, the villains' hi-tech Stane blasters proved too powerful and Zafar was forced to surrender. Zafar was ushered outside and accused the remaining Cabal that the Savage Steel project was about justice, not murder. The Cabal gunmen were soon surrounded by the newly-arrived police but managed to flee. (Darkhawk Annual#2/4) - A Cabal hideout exploded, killing the remaining members, just as three Stane technicians approached with new and updated Savage Steel armor. They ran back to their lair and inspected the armor inside its small suitcase. However, Zafar, who had been watching the Cabal base, had followed them and, heavily disguised, took the armor from them by force but nevertheless paid $10,000 for it, although the techies had expected five times this amount from the Cabal. Zafar then bound the three up to await the police. He later donned the new armor and, over a few days, practiced and experimented with it at an abandoned warehouse. He roared off into the night wondering if he could use it for good and break the bloody legacy of previous Savage Steel wearers. (Darkhawk#32) - Zafar had tracked Latverian terrorists to the Empire State Building, seeking to stop them before they could detonate their bomb. However, before he could apprehend them, Darkhawk appeared and the two tackled the terrorists on their floating platform. The Savage Steel armor easily countered the bullets fired at him and Zafar was able to place a tracer on them, but Darkhawk was then knocked out by an electrical shock. The terrorists' vehicle went into stealth mode and escaped while Savage Steel raced down to stop Darkhawk before he impacted with the ground. Darkhawk was slightly surprised and Zafar told him of his pledge to try not to kill his enemies. Zafar then set up a night meeting atop the Citicorp Building to follow one of his leads. Later, Zafar's nephew helped recondition the Savage Steel armor. He then flew out and met up with Darkhawk and together they tackled the Latverian extremists in their hideout by following the tracer. The Latverians fired AIM weaponry at the two, temporarily disabling Savage Steel , but he quickly recovered and flew after the escaping terrorists while Darkhawk took care of the bomb. Savage Steel fired a wide-angle stun blast that knocked out the terrorists before he dragged them back to Darkhawk. Savage Steel was about to tell the dark hero what more he knew of him but blasted away to avoid the police. (Darkhawk Annual#3/4) - Thinking over his career change, Zafar came across the local street gang beating up two children. The gang leader was quickly disarmed by Zafar and the thugs retreated. The boys, Joe and Tommy, told him of the gang's connection with the local drug lord, Pedro Sanchez. Zafar then had the boys monitor the drug pick-ups over a few days and they gave this information to Zafar. But the boys were soon captured by Raul and Joe was sent to find Zafar before Tommy would be released. After changing into the Savage Steel armor, he blasted his way through the wall of the thugs' hideout. He disarmed the gang members, throwing them aside, then blasted off with Tommy before blowing up Sanchez's hideout. Later out of armor, Zafar wandered off reconsidering his impact on others, himself and the neighborhood. (Darkhawk#50) - Seeing a news report of Overhawk's and the Mahari space pirates attack on New York, Zafar changed into the Savage Steel armor and joined Damek, Nova, Speedball and Spider-Man in a direct and concerted attack against the alien vessel but they were easily blasted away and fell away unconscious. After the threat had been overcome by Darkhawk, the revived heroes met up one more time before going their own ways. (Civil War: Battle Damage Report) - Tony Stark (Iron Man), Acting Chairman of the Presidential Super Hero Task Force, identified Savage Steel as a potential new recruit of the Fifty State Initiative although he had yet to comply with the Superhuman Registration Act. Stark also knew his secret identity. Comments: Zafar created by Danny Fingeroth (writer), Mike Manley (pencils) and Ricardo Villagran (inks). Danny Fingeroth (writer), Scott Kolins (pencils) and Tim Dzon (inks). The Savage Steel armor has had upgrades. There is even more potential for that if Stark took him on board as a new recruit as part of the Fifty State Initiative. In his very first appearance, Jimmy Zafar's skin color was very Caucasian. The sudden change of skin color parallels Turk and Gertz. The original Savage Steel armor received an entry in the OHotMU Master Edn. Pedro Sanchez was the local drug lord in Yonkers, New York. he had Raul lead the gang that enforced his will. Concerned over Zafar's interest in his drug dealings, he had two boys kidnapped and beaten to lure Zafar to his hideout but was instead faced with bullet-proof Savage Steel. He was thrown out of the building before Savage Steel blew it up to force Sanchez to move.